The Wood River Historic Chapel located at 446 E. Lorena, Wood River, is rich in history and has been restored to its original beauty dating back to 1916 when it was built by local immigrants to house the first Lutheran Church of Wood River. St. Paul Lutheran Church occupied the Chapel until it was sold in 1951 to the Reorganized Church of Jesus Christ of Latter Day Saints. 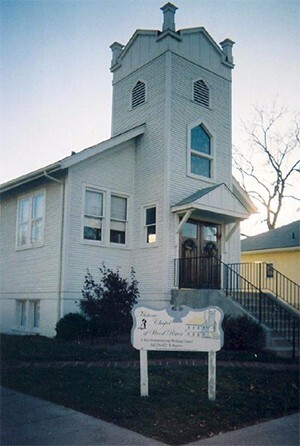 The Chapel was again sold in 1974 to the Gospel Temple Church. In December 1998, the Wood River Heritage Council purchased the abandoned building to save it from demolition. It was in a state of disrepair and a great renovation effort ensued. With the help of volunteers, donations from local businesses and residents, and the contribution of an Illinois Heritage Grant from the Illinois Historic Preservation Agency, the chapel was restored. As a result, the Chapel has been designated as a historic landmark by the City of Wood River. The renovation project was truly a community effort. Experience the beauty of romance of a simply elegant and quaint wedding at the historic Chapel of Wood River- a nondenominational church. Your wedding or special occasion will be a unique experience at an affordable price. The Historic Chapel features its original hard wood flooring, hand crafted wood pews and a beautiful stained glass window. The chapel has captured a moment in time making it the perfect setting for your special celebration of love. Other uses for the church may include a renewal of vows, religious services, recitals and other ceremonies. Seating is available for 40 to 50 guests. For information about the church, please call (618) 259-4632. To reserve the church for a special occasion, please call (618) 259-4632. Click here to visit the Wood River Heritage Council's website for additional information.